Borrowed from Clip Art Etc. 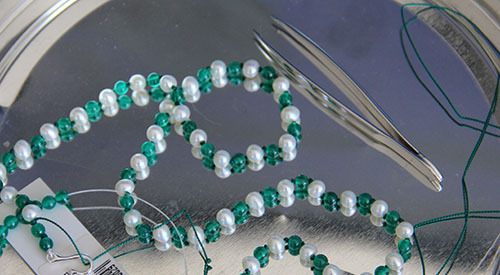 My current project involves natural colored freshwater pearls and polished green agate beads strung on green silk. I think they’d hang a little more smoothly if I hadn’t decided to double knot, but I love the way the big knot looks. Ah well. Ancient Ideas On the Origin and Virtues of Pearls. 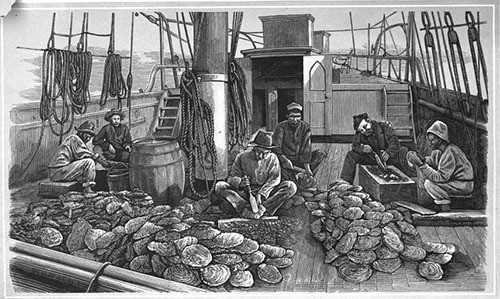 Opening oyster shells on a pearling ship.